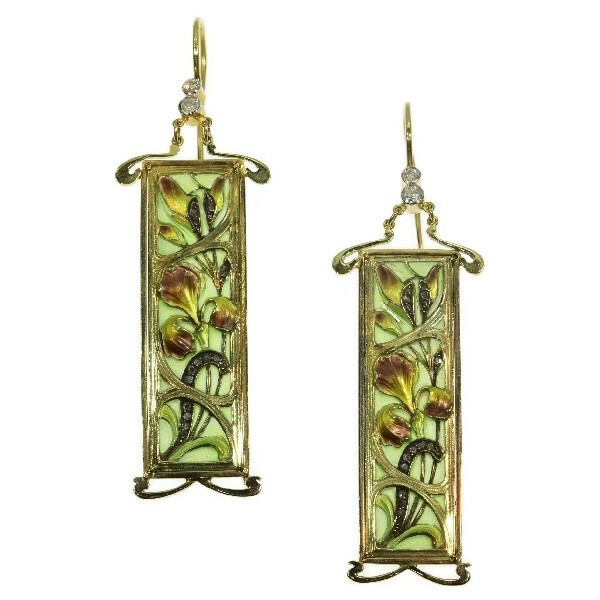 Plique ajour enamel Art Nouveau stained glass window earrings emaille a fenetre: Description by Adin Antique Jewelry. Within these picturesque Art Nouveau earrings crafted in 18K yellow gold and plique-à-jour enamel, a fleeting daydream of an iris meadow glistening of old mine brilliant cut and rose cut diamonds is captured by a glance through a windowpane. Almost whirling through the gold framework, these graceful irises are ever so eager to climb up their future goddess's neck. However, it was clear to us from the beginning that this piece wasn't in its original form anymore when it was first offered to us. Instead, it was previously altered into a small artefact as is shown on the photo with the presenting hand. Therefore, we've adjusted the two plique-a-jour lids into a pair of earrings in absolute accordance with the era in which they were manufactured, namely the Art Nouveau period. Style specifics: Art Nouveau - The floral ornaments and botanical designs are very typical for the Art Nouveau style. Also the use of curvilinear lines is typical for this period. Diamonds: Four old mine brilliant cut diamonds with a total estimated weight of approx. 0.32 crt. and 34 rose cut diamonds and senailles . A senaille is a simplified rose cut diamond, a small diamond chip with perhaps a few polished facets. We do not have the weight of the rose cuts diamonds nor the senailles which is normal in our trade when it comes to rose cut diamonds and senailles.